Security forces in the Democratic Republic of Congo have arrested 10 priests and more than 200 protesters over Sunday’s demonstrations demanding President Joseph Kabila leave power. The Catholic Church had called for demonstrations against the leader, whose constitutional mandate ended in 2016. Six people were killed in the capital, Kinshasa, when police used tear gas and live bullets to disperse the protesters, which also took place in other parts of the country. “We have registered the case of 10 priests who have been arrested, including Father Dieudonne Mukinayi of Saint Christophe Parish in Binza Ozone. He is detained in a residence of a government official alongside eight parishioners,” Georges Kapiamba of the NGO Congolese Association for Justice told the UN-sponsored Radio Okapi. “According to information we have, they were or continue to be mistreated. Their clothes have been torn. 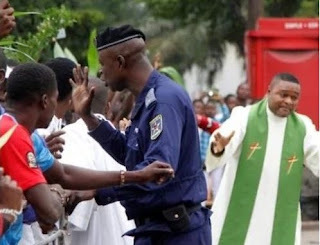 Two nuns are missing, 257 demonstrators have been arrested and are being held in various cells in Kinshasa,”Kapiamba added. The Lay Coordination Committee, an arm of the Catholic Church, had called for nationwide demonstrations to push for the implementation of a political agreement signed between the government and the opposition on 31 December 2016. Under the deal brokered by the Catholic Church, Kabila was to organise elections in 2017.